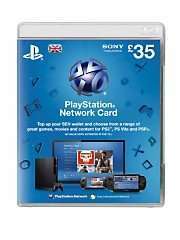 Littlewoods works - 44VUW - £30 off a £60 spend, and free delivery so £60 PSN for £30! Add 1 x £35 code and 1 x £25. I believe you need to open a credit account, but pay it off straight away, and then once vouchers received, email littlewoords and get them to close your account. As far as I know, this shouldn't effect your credit rating. What's the hassle? Do this pay the balance straight away and no harm done. I do this with very.co.uk every now and again I get a £30 of £60 code to use just rinse and repeat. If this affects your credit rating - nobody can give an absolute answer as it depends if you've already recently applied for credit, your current total debt etc etc. says code only works with first order, i just created account but says i cant use it! 10% Quidco for new customers too, making this at least another £3 cheaper! if anyone can confirm the code works (other than OP) it would be appreciated-don't want to create a credit account for nothing! "44VVF - This offer code is only valid on a first order"
says code only works with first order, i just created account but says i … says code only works with first order, i just created account but says i cant use it! I had the same happen when I first used Very... I'd love to get this deal as I'm running low, but as I've tried before it wouldn't be my first order. Bumbags! Great for those who manage it. Salt in wounds for me. Voting hot (through gritted teeth). COLD ANY CREDIT ACCOUNT FOr SOME DISCOUNt! I've been with Very since 3 years and so far, no spam or credit fraud or any rubbish posts. Might be random. With regards to PSN credit, personally i'd buy from here than from PSN store that gets hacked every often. You've got to love the paranoia about credit accounts on here. If anything, using credit but making sure to pay off in time actually improves your credit rating. Freely providing your details for retail companies is more of an issue than credit score. Put it this way- if they were not getting something more out of you signing up for this then they wouldn't be giving 50% off of a low premium PSN voucher. You'd never catch a high street retailer offering half price PSN credit. You've got to love the paranoia about credit accounts on here. If … You've got to love the paranoia about credit accounts on here. If anything, using credit but making sure to pay off in time actually improves your credit rating. It indicates your intention to buy stuff you've not yet got the money for, showing other lenders that they can make money off you. Credit ratings nowadays are mainly irrelevant, there are many lenders who'd lend to people on benefits who cannot afford to repay them. Bank loans are better for cars, and if you're a first time buyer you need 20% deposit, not a good credit rating. Yeah but applying for 4 catalogues in 12 months can't do you any favours surely? Yeah but applying for 4 catalogues in 12 months can't do you any favours … Yeah but applying for 4 catalogues in 12 months can't do you any favours surely? Try applying for a mortgage and you'll see, whats this Mr jaydog you want to borrow £200,000 yet you are so financially bad off you had to apply for credit for PSN credit. aside from the discussions around credit the code doesn't work, even though I've never used Very or any of these other sites before. So not only a waste of time but hassle as I now need to close this credit account I just had to open! your cedit rating is positively affected by the use of credit. if you use credit to buy something and then pay off that credit without incurring fees this is POSITIVE CREDIT. how do people not understand how credit works? Seriously? how do you think people end up with 5 credit cards? they are shown as positive trustworthy borrowers. Wow denied a mortgage based on a £25 credit account... HAHAHAHAHA seriously? aside from the discussions around credit the code doesn't work, even … aside from the discussions around credit the code doesn't work, even though I've never used Very or any of these other sites before. So not only a waste of time but hassle as I now need to close this credit account I just had to open! So I could sign up to catalogues 4 times a year, and pay it off straight after ordering, and it won't go against my credit rating at all? Nothing good can't come out of this! don't buy it! Apart from dirt cheap PSN credit? What's so bad about it? I've done it three times with very and once with isme, had no issues. "This offer code is only valid on a first order"
Add it to the title. STOP posting these because you can probably use it on everything anyway... Should be in vouchers. Code doesn't work for me, I already have a Very Account so guess that's why. Hot anyway!!! 10% Quidco for new customers too, making this at least another £3 … 10% Quidco for new customers too, making this at least another £3 cheaper!if anyone can confirm the code works (other than OP) it would be appreciated-don't want to create a credit account for nothing! Code never worked for me, Hmmmm! Credit Cards use the best security systems to protect your identity and fraud, they have equal liability with the purchases, refund you immediately if the purchases weren't made by you, and have the best customer service including a fraud team. Apart from dirt cheap PSN credit? What's so bad about it? I've done it … Apart from dirt cheap PSN credit? What's so bad about it? I've done it three times with very and once with isme, had no issues. I'm honestly shocked by some of the stupidity of the comments.